And, they have registered about 30.000 Taatu users in only 4 weeks! Aren’t VCs interested in companies / projects who can aggregate users at a very fast pace ? Update: the site for the moment is only in French & Dutch. I see autopromotion links in the interface. Indeed, a great way to sell advertisements to a very captive audience. 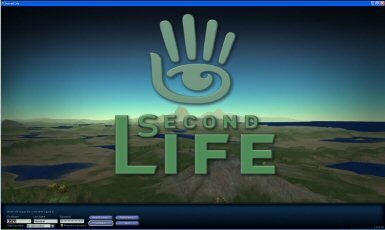 Another B-model would be to sell subscriptions, but I like the casual feeling on this world, with no combats, just a 3D way of IRC. Actually an interface to IRC would be an awesome idea! Hum... Just for the sake of it, I'm creating a new 3D category on this blog. My previous post on lecentredumonde.com showed that those guys didn't get it. But this universe is great. 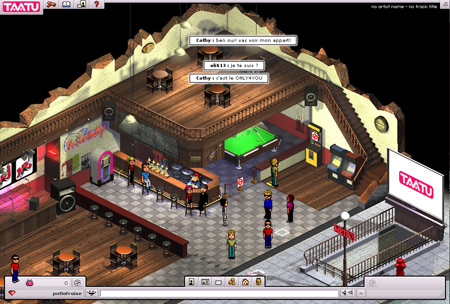 Next issue is with multiple IDs on different worlds that will allow 3D chats. Is there a standard out there for interconnecting all these worlds? I don't want to repeat the horror of Instant Messenging where we all have 5-6 IM accounts. Oh!!! (and I'm typing while I'm thinking about this): who's going to be the first to interface this type of virtual worlds with IM systems ... !? I'm running around the bar now. You can buy their virtual money (TATs) by SMS or phone ! 1,50 euros for 20 TATs. Virtual money in this system allows you to buy stuff such as furniture for your appartments. Also very interesting: they have a theater in which they show trailers. They can get paid for that, and starting adding e-commerce: sell tickets to shows, and even extend the whole model for e-commerce. They have machines in this world distributing virual magazines (the Taatumag) that you can readonscreen, and sponsored by NRJ radio, Cinebel (a movie portal), Out soon (? ), netevents (?à, and playerOne.be (a game portal). Great exposure (when the community grows) for these advertisers. There's even airfield: the popup says that in the short future you'll be able to FLY to another island (so another part of the game) for a few TATs... Another use then of virtual money to access more levels. This company operates out of Belgium. Good stuff. Update: readers have pointed me to HabboHotel, whose existence I had never heard of. Indeed a heftly 3rd round of financing last year by Benchmark capital for $23.5m... I should have noticed. Taatu is clearly a copycat, although I prefer it's graphical design (slightly simpler, better). BY the way we made it to the alarm:clock this morning... Funny. There's probably room for a second player in this space. Now someone's got to figure out how to interconnect them at some point, although I expect each platform to try to reach the largest audience on its own.